And what characterizes the economy we have? It’s bewildering because nothing works like it’s supposed to. For example, getting a college degree was supposed to guarantee a good job and an 80% lifetime wage premium over people without college degrees. The payoff for getting a college degree is declining while the risks of becoming a debt-serf due to crushing student loans is rising. The big premium that once accrued to college graduates is eroding for reasons of basic supply and demand: there are far more people with college degrees than there are high-paying jobs for people with degrees–even law degrees, MBAs and PhDs. But in an economy in which education credentials are in over-supply, that signaling mechanism is running up against a basic reality: a degree accredits very little about the student’s knowledge, problem-solving skills or professionalism. A degree is simply a proxy of knowledge, not evidence of knowledge or useful skills. A resume is equally thin on information that accredits a worker’s knowledge, useful skills and professionalism. A resume is a public-relations summary that everyone knows has been tailored to present the candidate in the best possible light. And precisely how useful and trustworthy is PR in any setting? Conforming to social behavioral norms and being able to grind through mind-numbing work used to be enough to create value in the economy–but this is no longer the case for high-value (i.e. well-paid) work. The “signaling” camp holds that a degree showing the student sat through four or five years of classes is sufficient to justify hiring the person. That the student learned essentially nothing useful doesn’t matter; the entire value of college is in the last class needed to get the diploma. In contrast to the “signaling” theory of value, the “human capital” camp holds that working knowledge is what creates value. If the student learns little critical thinking, real skills or practical knowledge, then a college degree has little value. What if conformity and being able to navigate formal systems/bureaucracies no longer creates value or helps people solve real-world problems? 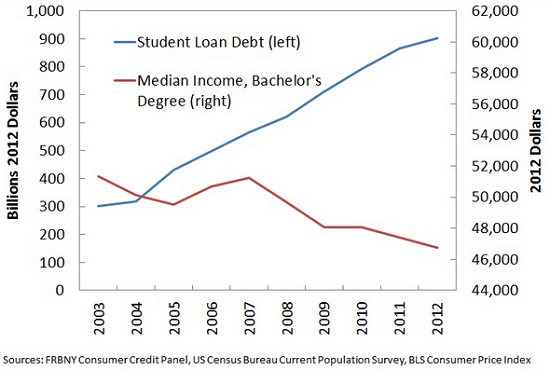 In the economy we have, the “signal” value of a college degree has sharply declined. This is why college graduates can send out hundreds of resumes and not even receive a single reply, much less an interview or job offer. Clearly, an entire new feedback loop of accreditation is necessary in the economy we have, and fortunately that feedback is within our individual control: it’s a process I call accredit yourself. The most powerful feature of accredit yourself is the process is open to anyone: recent college graduates, those without degrees, those re-entering the workforce, those seeking to launch their own enterprises–everyone who wants an income stream in the economy we have. The book makes a useful gift for high school and college graduates; if you give a Kindle ebook as a gift, you can schedule delivery of the gift to coincide with a graduation date. Thanks, you saved me the effort of saying the same thing. These “infomercial” articles are a waste of my time and I normally shun any site having them. Uhhh…so you mean people are going to need to think of alternatives to a degree. If you can’t simply say it, you probably are trying to hide something. Good article until the sales pitch for the book.